As more Americans report feeling stressed a lot of the time (American Sports Data), it is no wonder that mind-body fitness is dominating the fitness landscape. The baby boomer generation is seeking out alternative ways to supplement their fitness routine with “kinder, gentler” ways of exercising. Since 1998, the highest growth fitness activities have included Yoga and Pilates; the demographics center on women over the age of 35. 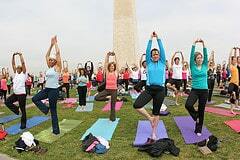 Yoga/Tai Chi alone has seen a 95% increase in participation since 1998, growing to over 11.1 million devotees in 2002. While in 2002, there were over 4.7 million Pilates enthusiasts, an increase of over 169% from 2000. Gender: 76.9% women/ 23.1% men. Age: 25.2% are 25-34; 15.7% are 35-44; 26.9% are 45-54. Income: Over 30% have an annual income over $75,000, with a full 15% earning over $100,000. Education: Almost 50% have attained a college-level education or higher. Also, an additional 40% have completed some college. Region: Nearly 20% live on the West Coast, almost 30% live in the Northeast, and almost 30% live in the Central United States. 58.4% or 8.7 million people have practiced Yoga for less than 2 years. 15.4% or 2.3 million people have studied Yoga for more than 10 years. More than half of Yoga participants surveyed practice twice or more a week. There are approximately 15 million US Yoga enthusiasts, up from 3 million in 1990. Yoga participants spend about $22 billion dollars annually on classes and Yoga accessories (mats, clothes, videos and DVDs). The average Yoga participant spends an average of $1,500 annually on Yoga. 85% of fitness clubs offered Yoga classes in 2002, as compared with 31% in 1996. The average Yoga center earns between $25,000 and $50,000 per year. Pilates, an exercise discipline, includes elements from stretching, calisthenics, balance and resistance training, has emerged in the last few years as one of the fastest growing exercise movements since 1998. As the mind-body exercise movement grows in popularity, Pilates represents one of the strongest niches of this trend. Pilates participation is up 91% over the last year. There were nearly 4.7 million participants. Women comprise about 90% of all participants. 44% of all Pilates participants performed the activity at home. The average age of a Pilates participant is 35.1. This material is based upon work supported by the U.S. Small Business Administration. Any opinions, findings, conclusions or recommendations expressed are those of SBDCNet and do not necessarily reflect the views of the U.S. SBA. This U.S. Small Business Administration (SBA) Grant is funded by the SBA. SBA’s funding is not an endorsement of any products, opinions, or services. All SBA funded programs are extended to the public on a nondiscriminatory basis.